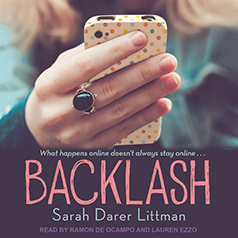 In critically acclaimed author Sarah Darer Littman's gripping new novel, what happens online doesn't always stay online . . .
She thought that Christian liked her, that he was finally going to ask her to his school's homecoming dance. It's been a long time since Lara's felt this bad, this depressed. She's worked really hard since starting high school to be happy and make new friends. Bree used to be BBFs with overweight, depressed Lara in middle school, but constantly listening to Lara's problems got to be too much. Bree's secretly glad that Christian's pointed out Lara's flaws to the world. Lara's not nearly as great as everyone thinks. After weeks of talking online, Lara thought she knew Christian, so what's with this sudden change? And where does he get off saying horrible things on her wall? Even worse—are they true? But no one realized just how far Christian's harsh comments would push Lara. Not even Bree. As online life collides with real life, the truth starts to come together and the backlash is even more devastating than than anyone could have imagined.